First, the dogs. I find 'em all the time. Really - I probably find strays 4 or 5 times a year. It is not unusual for me to call ahead and tell the kids to set up the dog crate we keep in the garage, as I've found another one. I've also got a pretty good track record for getting them back home, but a couple of times, I've had to call animal control. But at least for a short period, they are safe, loved, fed and cared for. Then there are the crazy people. I once had a really strange conversation in the National Basilica of the Immaculate Conception in Washington DC with a guy that hadn't showered in the recent past. Here I am, just soaking in the glorious art and grace of this beautiful building dedicated to Our Mother, and then I'm talking about aliens with this guy. Yesterday, I got on the bus to go to work, and a man who obviously was living on the fringes of society offered everyone who got on a hearty "hello". I was the only one who responded, and thus, he conversed with me for awhile. I talked about this once to a friend of mine, who is both a Franciscan Sister and a therapist. She said crazy people (and stray animals, presumably) had a sense of who is "safe", and I was a "safe" person. I'm glad of this, but it sure makes life interesting sometimes. I felt really bad for the guy on the bus yesterday. Yeah, he was a little weird and a little dirty, but he was kind, and having a good morning and wanted to share it with others. No one else responded...or even made eye contact. It didn't cost me anything to converse with him, and it made both our days a bit nicer. 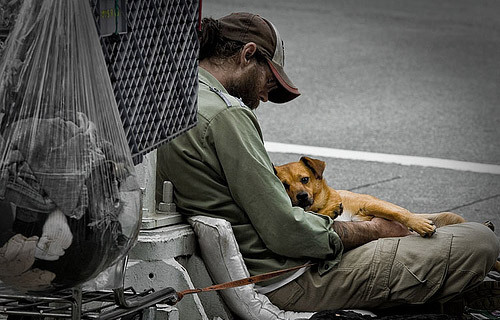 I cannot imagine life on the streets, either as a person or as a dog. There literally is danger everywhere. You are unsure about the very basics of life: food, shelter, water, etc. People treat you badly simply because of the circumstances you find yourself in. It must be constantly terrifying, unsettling and sad. Christ was homeless. He was born homeless, and then had to flee with Mary and Joseph because of the risk to His life. He said Himself He had nowhere to lay His head. While it can be a bit jolting to have these incidents occur in my life, I try to look at it as the "perfect joy" St. Francis spoke of, and let Christ be present, as only He can be, in crazy people and stray dogs. Congratulations for being one in a million. Is hard to find people like you and, like my mom says, we have to stick together to fight for the worlds godness. Continue your good work, im sure joys will come to your life, joys that bad people cant appreciate (poor fulls are just mistaking themselfs). Its a gift to have a heart these days.